Scottish politician Nicola Sturgeon is the current Scottish National Party (SNP) leader, and First Minister of Scotland. She has at times been described as ‘The most dangerous woman in Britain’ by British tabloids the Daily Mail and The Sun. Who is Nicola Sturgeon, how old is she, when is her birthday, how tall is she, what university did she attend, where was she born and what is her background? Nicola Sturgeon is a member of Scottish Parliament, serving as First Minister of Scotland and SNP Leader. She was born Nicola Ferguson Sturgeon on July 19, 1970, making her 48 years old. Her father was an electrician and her mother a dental nurse. She’s 1.63 metres tall and studied Law at Glasgow University. Sturgeon was a qualified solicitor before her election to parliament in 1999. She was involved in politics from an early age, joining in with the SNP’s campaigning from the age of 16. Why is Nicola Sturgeon famous and what is her occupation? 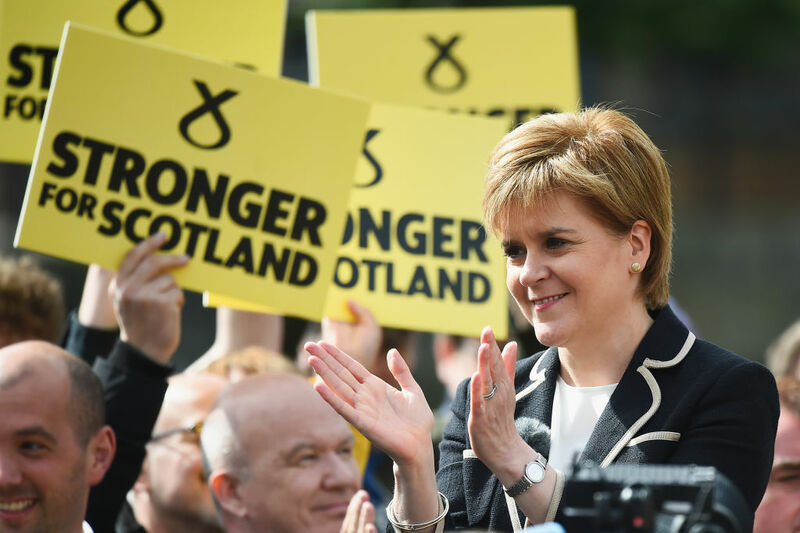 Sturgeon is the first woman in history to be SNP leader or Scotland’s First Minister. She succeeded Alex Salmond as SNP leader on November 14, 2014, and then as First Minister on November 20, 2014 the same year. She is also an MP for Glasgow Southside and is a famous supporter of Scotland’s right to independence. What is Nicola Sturgeon’s net worth? Her net worth has not been reliably estimated. How much does Nicola Sturgeon earn? Nicola Sturgeon’s tax return for the year 2014 to 2015 showed an income of £104,000. She was entitled to earn more as First Minister, however she voluntarily froze her own pay. Is Nicola Sturgeon married, who is she married to, what do they do, who has she dated? The politician is married to SNP’s Chief Exec, Peter Murrell. She has won an award for ‘Politician of the Year’ at the first ever Scottish Lesbian, Gay, Bisexual, Trandgender, and Intersex (LGBTI) Awards. In the early ‘90s she dated SNP activist, Ricky Bell. Is Nicola Sturgeon an MP, what is her role? The politician is a Member of Scottish Parliament (MSP). Her role involves promoting Scotland, chairing the Scottish Cabinet, and making/overseeing important government decisions and their implementation. What do Scots think of Nicola Sturgeon? The majority of Scots seem to be proud of her; she is a well-liked, popular politician in Scotland. What party is she from? She is from the Scottish National Party, who are nationalist and social-democratic. Sturgeon has spoken in the past about her dislike of the Tory party. She’s credited her motivation to get involved with politics to a hatred of Margaret Thatcher. What has Nicola Sturgeon got to do with Brexit, what has she said about Brexit, did she vote and campaign for Brexit, why does Nicola Sturgeon want a hard Brexit? She did not support the Brexit leave result. She has said it was unacceptable that Scotland be taken out of the EU, saying that it was against the country’s will, after the majority of Scots voted to remain. She believes it would be more beneficial for Britain to remain in the EU. The politician suggested a second EU referendum after the leave result, to allow the public to revisit their decision. She has pressed for Scotland to be able to stay in the single market despite the result. Sturgeon has stated that Scottish independence should still be an option after Brexit is completed. She isn’t thought to speak another language; she does support Gaelic-speaking schoolchildren’s education, and would like more Scottish children to learn an additional language in primary school. Where does Nicola Sturgeon live? When in Edinburgh, she lives in Bute House, Charlotte Square. Bute House is the First Minister’s official house. Otherwise, she lives in her own home in Glasgow. Does Nicola Sturgeon have children? Nicola Sturgeon has no children. In 2016, she revealed that she had suffered a miscarriage in 2011 at the age of 40. How many houses does Nicola Sturgeon own? She owns one home in Glasgow.